Horses critters and other tales of a cowboys life. I know the tales of a cowboys life is a little bit of a departure from RV Boondocking. But then again, don't we all do our wandering looking to find stories? Anyway, I hope you'll find a bit of entertainment and maybe some examples of how not to pursue certain activities in some of the deeds and misdeeds of my back trail! A lot of 'em didn't seem so entertaining at the time. The humor didn't appear until I got a little distance on the event and could look back and see what it must of looked like to anyone looking on! Living on the ranches a fella has to learn to just dive into things he has little experience with. Problem is, you get into that way of thinking and you start failing to put on the brakes when a more thinking person might say "I'm in over my head, maybe I oughta go get some help!" So where those thinkers stay healthy and whole, a cowboy just bulls on through and later has the scars and broke parts to prove it! And of course, the stories to tell about it! Sometimes that "git 'er done" attitude is useful in RV Boondocking. But, just like in a cowboys world, I manage to get myself into some genuine jackpots there as well. How about the time I got the front end and the back end of our motorhome hung up on various parts of the mountain ............... while the drive wheels weren't in contact with much of anything! Never thought I'd ever have a use for these tales, but you never know what's around the next bend in the trail. 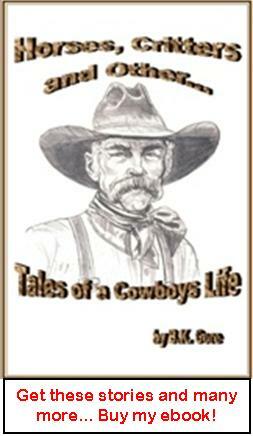 So check out a few of the stories from my book Horses Critters and Other Tales of a Cowboys' Life and see what you think! Are you a reader of Western Fiction? I've just published my very first Western Novel. If tales of Old Time Western Heroes tickles your fancy, Check out my story; A Matter of Honor. I hope you enjoy it!